Promising to be comfortably within most airlines’ hand luggage limitations, this sturdy backpack weighs a mere 700 grams. It boasts three internal divisions, the biggest of which has a strapped and padded laptop compartment and a double-sided padded tablet pocket as well as generous space for notebooks, clothes, cameras: whatever might be needed. There are two smaller external pouches ideal for holding maps, umbrellas or bottles of water, anything that might be needed in a hurry. 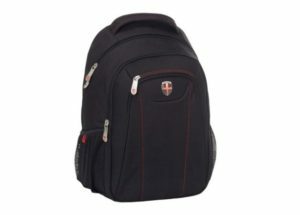 The backpack is made from sturdy 600D polyester. The straps are padded for extra comfort. We were expecting a plain black, average-looking backpack and found the reality to be a pleasant surprise. The Ellehammer logo, a shield-shaped metal tab, and the delicate red thread detail add a pleasing elegance and attractiveness to the sturdy pack. It arrived flattened for ease of packing and our chosen tester (an older man with a fondness for spur of the moment weekend city breaks) was not impressed at first sight. However, opening out the bag brought his eyebrows up in pleased surprise. The compartments unfolded to show the spaciousness of the interior. He filled it up with a couple of changes of clothes. He tucked water bottles and an umbrella in the side pouches and sliding his laptop – with a little difficulty – into the back-most compartment where it was firmly held in place by a thick elastic strap and limpet-like Velcro. He set off for his weekend visit, backpack settled comfortably on his back. When he returned, our tester had nothing but praise for this sturdy product. It easily held everything he needed for his time away. This laptop was snug and secure even while travelling on a crowded train. A couple of transient rain showers gave him cause for concern. However, he found that, despite the backpack not claiming to be waterproof, or even water resistant, his belongings remained bone dry and protected from the elements. A win, as far as our tester is concerned. The straps are adjustable and well-padded for comfort. This means that even when the backpack is full it remains easy to wear for long periods of time. The backpack is suitable for carrying on airlines, with some small metal features. The shield-shaped logo mentioned above may set off airline security alarms – but hand luggage must be x-rayed anyway, so this is unlikely to be a huge problem. 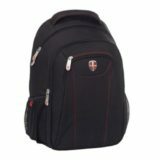 The sturdy construction of the backpack ensures that the contents are safely contained. The straps do not cut in and cause injury to the user. The backpack is simple to use, easy to pack and unpack, with a host of handy pockets and features designed to make locating items like keys a doddle. While the backpack is not a cheap option at nearly £40.00 depending on the retailer. It is worth every penny in our tester’s eyes. It is so well-made and sturdy that he is sure it will last him for many years to come.